That wasn’t the answer she was looking for, but most of us might well have believed that after this past Friday. If you wanted to buy a Valentine’s Day card, you had to wade through a slew of over-the-top, slushy, red-heart-covered cards. We might associate that love for a sweetheart, especially on Valentine’s Day, with one of the six Greek types of love, eros; that’s romantic love, which has an element of desire and sexual passion. Eros is named after the Greek god of fertility. It is the kind of irrational love into which we can fall ‘madly’ – and that apparently scared the Greeks, because that meant a loss of control. Probably not read in church as much as other verses from the Bible! The third is ludus, playful affection, the kind of affectionate teasing we have as young children with friends as we play together, or as friends hanging out together. Of course, there is also self-love, the Greek word is philautia. This love of self can be a negative, narcissistic variety, or a version that displays security in one’s own skin, so that, as Aristotle described it, “All friendly feelings for others are an extension of a man’s feelings for himself.” It enhances our own ability to love. And then the final type of love, agape or selfless love, which is given to strangers as well as loved ones. It has been variously described as universal loving-kindness in Buddhism, or having the meaning ‘charity’ in Latin. It is the highest form of Christian love, called ‘gift love’ by C.S. Lewis. Thinking about these different types of love, we might realize that there is much more love in our lives than we would at first have thought, a consoling thought hopefully. And we might also realize that one person cannot personify all the possible varieties of love, unlike the saccharine sweet romantic ideal of our Valentine; what a burden to place on someone we love, when we expect them to provide all the varieties of love that we need in our lives. Knowing about these types of love also helps us to think about the natural way our relationships can change, mature, and deepen over time. Maybe having all those forms of love in our lives makes love ordinary, in the sense of being commonplace…not that we should take love for granted, but that love is a normal state of being, a normal part of being human. Ordinary love – when U2 sing about it, I think the meaning is pretty clear. "We can't fall any further if we can't feel ordinary love. And we can't reach any higher, If we can't deal with ordinary love.” Think about the two extremes of love – self-love, love that is only concerned with ourselves; “We can't fall any further if we can't feel ordinary love.” If we can’t get beyond self-love, how can we truly fall deeper into love with anyone else? “We can't reach any higher, If we can't deal with ordinary love”: and if we don’t love ourselves, we can’t then open ourselves up to loving others, or to use the transforming power of love for others. "Ordinary Love" was a song written to honor Nelson Mandela and it’s included in the biography film Mandela: Long Walk to Freedom. After decades in prison, being freed and elected as the president, Mandela wanted to rebuild South Africa, but this couldn’t be possible if all the people of South Africa remained angry and full of hate. So love is vital when it comes to transforming the world. But we know that when we open ourselves to love – loving ourselves, loving another, or loving the world – we pay a price in being vulnerable. Both daring to love, and receiving love, bring us to a place of vulnerability. That is why it is so difficult to open up to love. But that is also why we come here – because it is a safe place, because here we try to model what it means to love and accept one another and to encourage spiritual growth. But after the shooting, both Knoxville congregations pledged to remain open and welcoming, and in fact chose to embrace their inclusive and loving spirit even more boldly in the days that followed, supported by their wider community and religious neighbors. In doing so, they also drew on their Unitarian Universalist heritage, which [like Nelson Mandela,] consistently urges us to choose love over hate and fear. Since then, UUs have worn yellow t-shirts whenever they have been involved in public witness. They are the visible sign that we are standing on the side of love. Some of you have heard me speak about the UUA General Assembly held in Phoenix three years ago, where we had a mass public witness at Sherriff Arpaio’s tent city detention center. When we arrived wearing our t-shirts, there were other protesters there, many of them relatives of those detained, almost every one Latino. They saw our t-shirts and described us as ‘the love people’ – ‘the love people are here’. And so it is that we UUs are seen, and more importantly how we need to be seen, in a period in American history when the poor and disadvantaged are being targeted for cuts to services they desperately need, in favor of the bottom line of the almighty dollar; where working class people are ignored and ridiculed when they ask for a decent living wage and for states to allow them access to healthcare coverage that truly benefits not only them and their families, but the functioning of a fair and flourishing economy. We need to be seen at a time when our environment is being threatened, when changes in the climate are being ignored at best and denied at worst; when our earth is being poisoned by Fukushima, our water supply is under serious threat of vanishing in some parts of this country and around the world, and our land is under threat of being ravaged by fracking and by ill-conceived and immoral projects like the XL pipeline. We are standing on the side of love when we seek to house the homeless. We are standing on the side of love when we seek to feed the hungry. We are standing on the side of love when we seek clean water for those who have none. I was conscious when I was writing this sermon that this was the week of the State of the Union address. President Obama said during his speech that as the country’s executive he will lead by example. I was reminded that sometimes for ministers, leading by example is a pretty high bar to set for ourselves. The Reverend Billy Graham tells of a time early in his ministry when he arrived in a small town to preach a sermon. He wanted to mail a letter, and so he asked a young boy where the post office was. When the boy had told him, Dr. Graham thanked him and said, "If you'll come to the Church this evening, you can hear me telling everyone how to get to Heaven." The boy said. ""I don't think I'll be there, you don't even know your way to the post office." The following short quiz consists of 4 questions and tells whether you are qualified to be a “leader.” The questions are not that difficult. --This question tests whether you overthink – that is, tend to do simple things in an overly complicated way. --This tests your ability to think through the repercussions of your actions. Okay, even if you did not answer the first three questions correctly, you still have one more chance to show your abilities. --This tests whether you learn quickly from your mistakes. But there is no magic set of questions that can tell us who would make a good leader. So how do we know what a good leader is? We most likely rely on the images or stereotypes that we are most familiar with in our culture; many of them come from the stories or fables we know from childhood that we have never really critically examined. Leader of the Pack – I know you’re thinking I am really too young to remember the original song by the Shangri-las but the story is a tragic one, about a girl who falls for the leader of the motorcycle pack: think Marlon Brando in The Wild One: leathers, testosterone, perched on a Triumph Thunderbird with a cigarette hanging from his lips. This is the kind of leader who defends his status, and who seeks to defeat the enemy with the help of a loyal band: Peter Pan has his own pack, lovable but ready to defend him to the death, like TinkerBelle, before she is saved by the chorus of voices of those who believe. Robin Hood is another noble leader of the pack, whose roguish behavior is virtuous because he robs the rich to give to the poor. His followers swear allegiance to him and fight on his behalf against the men of the sheriff of Nottingham. Me Tarzan, You Jane – this image drips with machismo: remember Johnny Weismuller and Maureen O’Sulivan in the old black and white Tarzan movies? It is odd how a perfectly capable, independent western woman comes under the spell of the ‘ape-man’ who lives with the great apes of Africa, and becomes his feisty but loyal mate. Father Knows Best – this is a model of leadership originating in a patronizing, yet benevolent, patriarchal dictatorship. We can recall Biblical patriarchs, such as Noah, who in the face of ridicule and disbelief builds an ark because God tells him to; Abraham, who is within inches of sacrificing his young son Isaac because God tells him to; even some secular dictatorships, like that of Stalin, portray the leader as a father-figure who is doing what is best for his subjects (even if it means the deaths of millions). 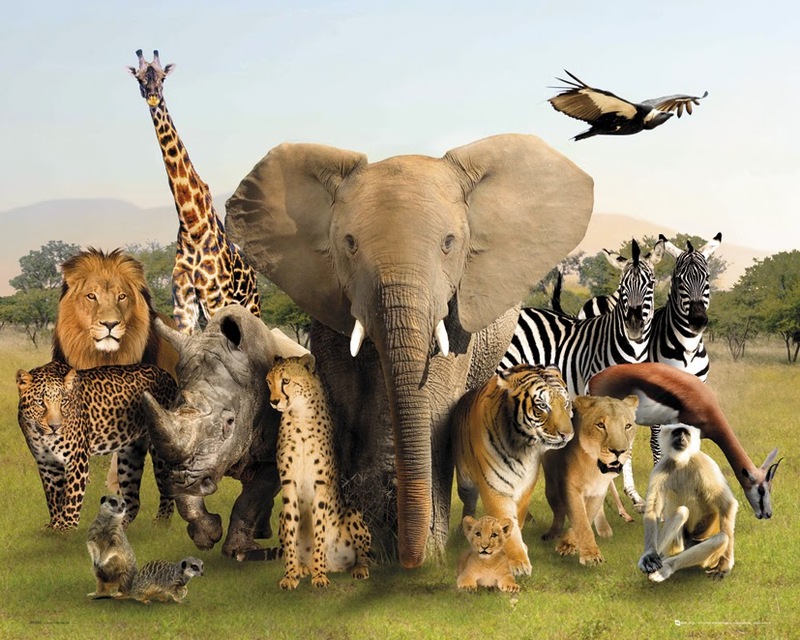 Now, all of these models rely on leaders and followers; even a couple of culturally inappropriate terms for leadership, like ‘low man on the totem pole’ and ‘too many chiefs and not enough Indians’ are predicated on the subordination of some to the authority of others. [Jesus] stood up from dinner and removed His outer garments. He then wrapped Himself in a towel, 5 poured water in a basin, and began to wash the feet of the disciples, drying them with His towel. 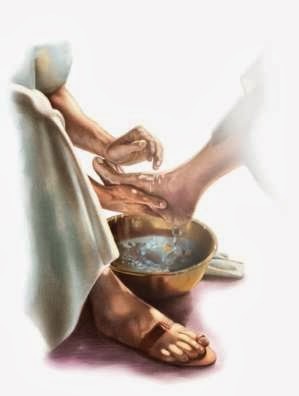 “After Jesus finishes washing their feet, he puts his outer garment back on and returns to his place, asking, Do you understand what I have done for you? (v. 12).” It seems that the disciples “can at least grasp his act as an example of humility. Jesus' understanding of the characteristics of a teacher and a [leader] are quite different from those of the disciples and their culture. Jesus then says: 15 I am your example; keep doing what I do. And he concludes: 17 If you know these things, and if you put them into practice, you will find happiness. So in making the disciples ‘fishers of men,’ Jesus passes on to them the meaning of their calling; and that meaning is service. No jockeying for position or status – when that does occur between the disciples, he stops it and draws them back again to the mission he has set for them: whatever you did to the least of my brothers and sisters, so you did to Me. In November I was at the Ministers’ retreat at The Mountain with the theologian Matthew Fox, who spoke to us about the training of prophets. Prophets are called and many times they resist, because they know that answering the call might lead them out of a safe place and into the unknown. But Fox said the way to discern your calling is to ask yourself honestly: What brings you alive? What breaks your heart? What do you want to do? What keeps you from doing it? When we answer those questions truthfully then we find, perhaps surprisingly, what leads us to be of service to the greater good. Tom Owen-Towle says that “each of our chosen congregations is a potentially mighty group, full of power and purpose” (Growing a Beloved Community: Twelve Hallmarks of a Healthy Congregation, Apr 2004, 24). We are surprised just as the disciples were, to find out that using that power and purpose turns us all into leaders of one sort or another. And we go back to the question, how do we know what a good leader is? When we are identifying our gifts, which ones stand out as being qualities we need in the leadership of this congregation? I would say that the quality most needed from leaders is generosity; just as Jesus made the extravagant gesture of washing feet, so generous that it embarrassed the disciples, a leader who can give of oneself to others is of most benefit. And this makes sense, although it might not be the quality you were thinking of; without generosity, love can’t be given fully; justice is acted out only according to law and not compassion; and how can a leader give much in the way of her time and talent without generosity? The little artist in our story this morning (Dot, Peter H. Reynolds) creates a dot; that’s all she thinks she can do, but it becomes a masterpiece. And through her encouragement and generous spirit, others discover their talents. One of these tensions is balancing an inward focus on the people who are already connected to our church with being outwardly focused on who we haven’t reached yet. 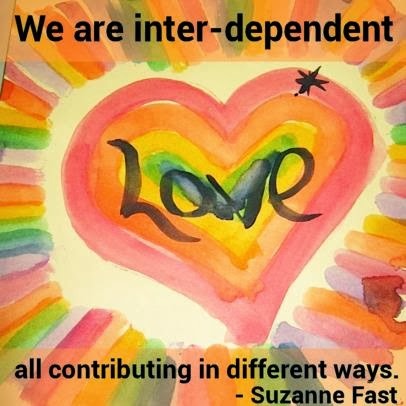 Another is the tension between relationships vs system; as much as we love each other and feel like a family we realize that families and churches and all organizations function as systems. It is interesting to read the Book of Acts in the New Testament because we see the ancient Christian church dealing with the dawning reality that someone had to develop a system for serving people. In this church we all take a lead in this through our covenant, in which we spell out how we intend to be together. And we have a system of a board of trustees and committees that spreads the work among us. The modern church is made up of a core of paid and volunteer leadership. The “professionals” amongst us in the church can’t do everything, but at the same time … paid staff help the ministry move forward in a way that totally volunteer driven organizations just can’t do. Another tension for leaders arises from the fact that we’re called human ‘beings’ … not human ‘doings’. As leaders we are called to “do” even when we don’t feel like it – as the song says, You gotta do when the Spirit says ‘do’ – sometimes that means doing things that will lead to internal transformation in us that will then allow us to lead others there. Some times we have to act before we become. That is why our leadership workshop is so important: if you don’t feel like you are a leader yet, you can do some soulwork in order to become one. And finally, the energy and activity that is happening in our church is a good thing … but we need to worry about how we’re reaching the people who aren’t here yet. We need to be content on the inside with what we’ve done while, at the same time, feel the pull to look beyond where we are today. Unitarian Universalists have led in the struggle for civil rights and equal rights; many other faith communities have been reluctant to join us but we’ve gone anyhow. And this determination to lead into the future can be seen on a small scale too – in fact, this is what the leaders of UUCA are doing with the focus on technology this year, because we know that many of our visitors are not walking in blindly not knowing anything about us; they’ve already checked us out on our website. Keeping up that website, which is our map for those seeking a new religious home, is vital. Leaders have to make decisions about things that they might not necessarily need themselves, but recognize that in order to engage new or potential members – including the children of this congregation – we need to step up our technological know-how. Leaders in this church are busy and inspired, and the Board executive committee wants to meet with you at 12:30 to tell you about the work they’ve been doing. Specifically, the board has been working with me on our developmental goals – and leadership development is the primary one. The workshop next Saturday could go a long way towards helping us reach that goal, but only if our members turn out to support it. You don’t even have to pay to come! But it is important to inspire the members of this congregation to step up as new leaders. We all admire the long-term leaders who we have grown to trust and to rely on – but the flipside of that is burnout, people who are relied upon for too long simply need a break; and in a democratic organization everyone steps up to take a turn. The Unitarian preacher Theodore Parker says - ours is a faith of the people, by the people, for the people – that was such a meaningful phrase that Abraham Lincoln borrowed it. Owen-Towle concludes that “the job of a minister is to lift up the duties and destinies – the lines – that a church tends to forget or lose sight of.” (24) That description is especially appropriate for my role as developmental minister; it is the congregation through the board who have set these goals, and I am here to help you keep sight of them. To those who have recently begun attending, and to those who have been with us a while longer but who have never gotten around to joining the church: Pathway to membership is a way you can begin to think about how you can contribute to the mission of this church. We take our mission seriously – we read it this morning and it’s always printed on the back of the order of service. Next Sunday is the first Pathway to Membership class, UU Heritage, followed on Mar. 2nd by Community and Connection. of justice, freedom, peace for all. wherever light of conscience leads. a church where every mind is free. And for me, the third and final verse is talking about – us, each and every one of us, where each of our gifts are spirit-filled and can be used to open the door to all those who need us, who need our free liberal religion. for all who choose to step inside. We are all called; we are all called to serve; and we are all called to lead. That is what I believe.